Oz Tuff® is a high quality couch with a dark emerald green colour. 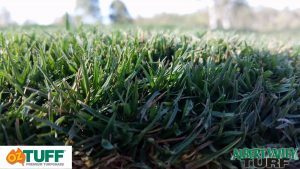 It has a fine leaf structure and lacks upright growth, instead growing laterally across the ground significantly reducing the mowing frequency unlike most common couch varieties. 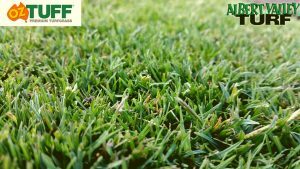 Oz Tuff® has superior turf strength and resistance to surface damage in high traffic situations and has been voted #1 for wear tolerance in a 4 year study. It’s moderate thatch layer provides greater wearability as it protects the stolons and rhizomatic growth. It’s extensive deep woody root system which helps store moisture and sugars below the surface away from the sun giving it exceptional drought tolerance. It can also stay greener and recover faster in droughts unlike other turf varieties. Oz Tuff®has low nutritional requirements which means it can tolerate poor quality soils from sand to clay to shaley rock. It does not need to be fertilised regularly and also has a pest and disease tolerance with proven studies confirming lawn grub and couch mite are less active in Oz Tuff®. It’s high salt tolerance also makes it a no-brainer for beachfront properties and foreshore parkland’s. Oz Tuff® takes faster if establishment watering is heavier and less frequent. Depending on the local climate one good watering per day is recommended in the first week. Only a couple of watering’s during the second week and that is all that should be required. It requires mowing every 2 weeks at a height of 18-25mm during summer, and every 4 weeks at a height of 25-30mm during winter. Oz Tuff can tolerate low mowing heights without evidence of scalping so for the manicured look mow at a height of 12-25mm. As a rule of thumb avoid taking more than 1/3 off the leaf at any time. It stays green throughout the seasons giving you have a fantastic looking lawn without the headache of mowing, fertilising and weeding. Oz Tuff® can only be supplied by a licensed grower so contact us today. 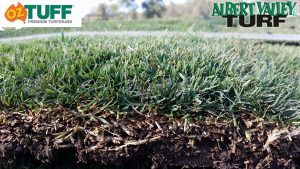 Albert Valley Turf has been operating for over twenty years. We also supply Sapphire® Soft Leaf Buffalo, Empire™ Zoysia and Wintergreen Couch We have an experienced landscaper on-site who can assist you to make the right decision for your garden and we offer delivery and turf laying services.